Two staff members have admitted failing to take reasonable care of a disabled pupil who suffered brain damage when he was submerged in a swimming pool for 90 seconds. Sam Sebastian, 18, also suffered a cardiac arrest at West Gate School, in Leicester, on 27 January 2016. 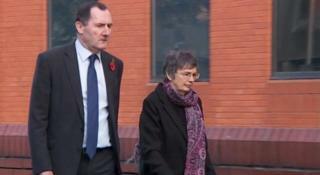 Eileen Coull, 63, from Leicester, and Marilyn Smith, 61, from Ratby, Leicestershire, will be sentenced at Leicester Crown Court on 13 July. A charge of wilful neglect was dropped. The teenager, who has mental and physical disabilities, slipped out of his rubber ring and was underwater for a minute and a half before being revived. He also suffered lung damage following the swimming lesson. The court had heard it was difficult to assess the extent of his injuries due to his disabilities. Correction: An earlier version of this story stated Eileen Coull and Marilyn Smith were charged with wilful neglect.